A Stylish Folding Arm Awning. Shan Full Cassette Folding Arm Awning. 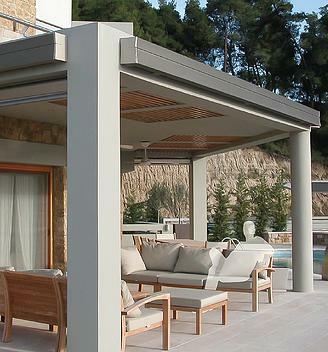 The Sleek Looking Kumo Folding Arm Awning. Our range of European inspired folding arm awnings in Melbourne provide the ultimate in shade and versatility. They are perfect for extending your outdoor entertainment area, and can be installed over decking, patios, terraces and balconies. Folding arm awnings are also great for commercial use, and are perfect for restaurants, cafes and shop fronts. By providing sun and weather protection, you can enjoy your outdoors all year round. The simple design of our retractable awnings makes them easy to use, and great to look at. They are available in two control options, which includes a traditional fold out crank, and also a motorised system. Our range of retractable awnings in Melbourne come custom made to the designs and sizes that you require. Get in touch with us today, for the best prices and quotes on our affordable, custom made retractable outdoor awnings range. Our retractable awnings are engineered to be tough, durable and to deliver outstanding mechanical performance over their lifetime. We proudly offer a 5 year warranty as testament to our quality. Our Folding Arm Awnings Range of Shan, Kumo, Stein and Klip Awnings are European inspired, proudly made here in Melbourne. Our retractable range is built for Australian conditions, with stainless steel screws, pins and an eight link stainless steel arm chains. Our products will stand the test of time. Our Shan, Kumo, Stein and Klip Folding Arm Awnings come with DAT- Dynamic Arm Torsion System. This feature ensures the ultimate chain and fabric damage prevention. Our selection of awnings is engineered to have fewer internal components than most, to produce a superior longer lasting retractable, folding arm awning system.